President Barack Obama ponders the existence of ketchup. 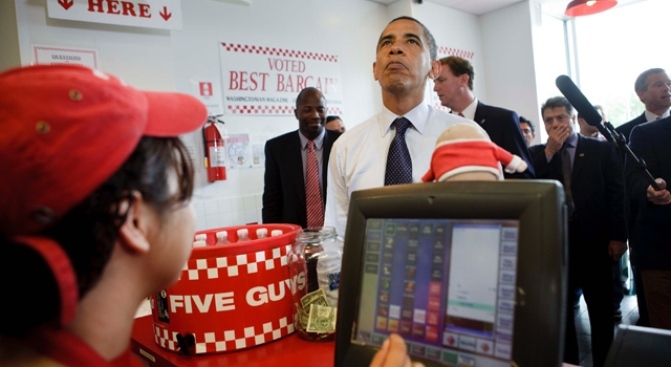 President Obama continued his D.C.-area burger tour Friday with a trip to Five Guys near Nationals Stadium. This time, instead of taking regular Friday lunch buddy Joe Biden, he took NBC anchor Brian Williams and his crew, who were following the president around all day for a "day in the life" segment. According to the White House press report, there was a huge scream from people outside when the president and company pulled up. The president ordered a cheeseburger and fries, and once again he dissed ketchup. He picked jalapenos, tomato, lettuce and mustard for his burger. After ordering, Obama walked around the restaurant saying hello to some customers while eating peanuts, which are a staple snack at Five Guys. When asked by one customer how his presidency has gone so far, he said it has been about what he thought it would be like. "More problems than I thought, because we didn't know the economy was going to collapse," the president said while chucking some peanut shells. Obama visited Ray's Hell Burger in Arlington, Va., a few weeks ago. First lady Michelle Obama took her staff to another Five Guys in Washington earlier this year.